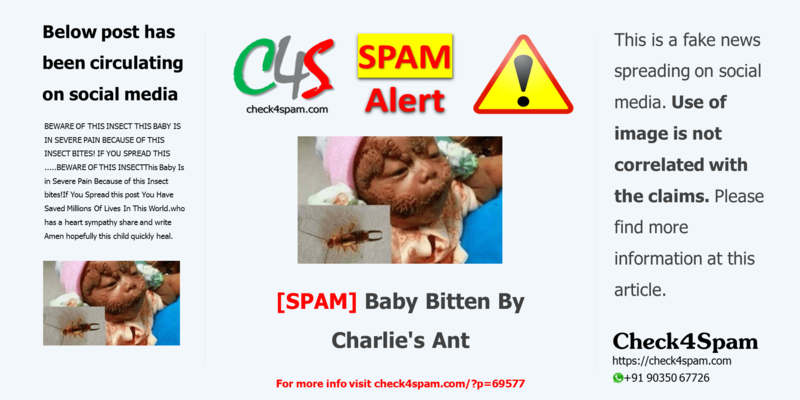 [SPAM] Baby In Severe Pain Because Of This Insect Bites! This was a fake news shared by Ambaland.com. Please find more details at the verification section of this article. BEWARE OF THIS INSECT THIS BABY IS IN SEVERE PAIN BECAUSE OF THIS INSECT BITES! IF YOU SPREAD THIS ….. This Baby Is in Severe Pain Because of this Insect bites! If You Spread this post You Have Saved Millions Of Lives In This World. who has a heart sympathy share and write Amen hopefully this child quickly heal. This was a fake news spread by a website called Ambaland.com. Use of image is not correlated with the claims. The baby in image is showing symptoms of Linear Nevus Sebaceous Syndrome. The insect shown in image is Earwig where as the post claims it to be Charlie’s Ant. Charlie’s Ant is not an ant but a beetle, Rova Beetle. They do not bite or sting but their blood contains strong toxins that can create irritations on skin and in eyes. The post says that the insect bite caused all the pain and rashes on baby’ face. This statement itself is wrong. The post is shared by many on social media under false claims. We all have prayers for baby but It is incorrect to spread false information. This kind of post actually misleads about the facts about things in our life. Be careful and please do Check4Spam before you believe in news that goes viral. Be skeptical but not cynical.